MCFE has released its 2017 edition of Comparison of Individual Income Tax Burdens by State. The study, based on tax year 2014 information, is the eighth edition of this report now published on a biennial basis. The study models 38 households based on different combinations of income, age, and size and calculates how much state and local income taxes they would pay in each of the 41 states that have an income tax plus the District of Columbia. It shows how state and local income tax burdens vary between states while offering insights into important state tax policy issues such as tax competitiveness, income tax progressivity, senior taxation, and state earned income tax credits' impacts on low income households. The report also calculates federal income and payroll tax liabilities for all 38 households and summarizes recent findings from alternative methods of evaluating state individual income taxation. Based on the difference in effective tax rates (tax burden divided by income) between the lowest and highest income households, Minnesota has the most progressive income tax system in the nation. Without the state's earned income tax credit Minnesota ranks 5th in progressivity, but its inclusion -- one of the nation's most generous and accessible -- propels the state to the top for the first time in this study's history. Minnesota's income tax burden ranks in the top ten nationally for over half (21 of 38) of the taxpayer profiles and in the top five nationally for 10 of these filer types. 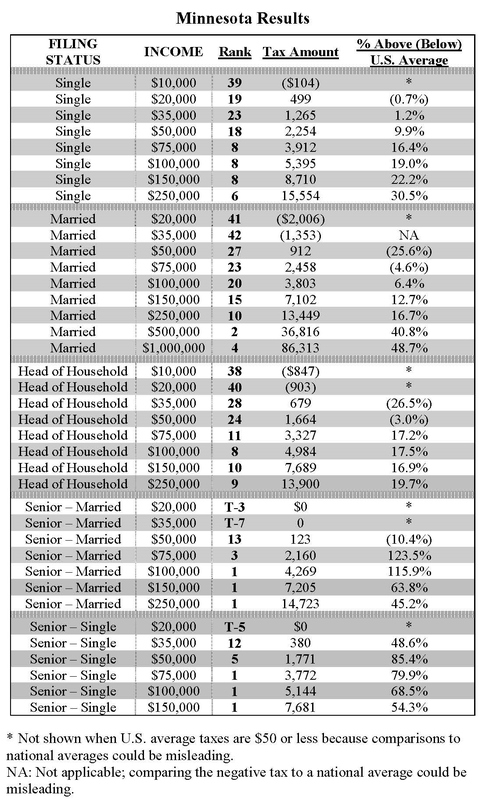 Most of the top ten rankings are for households with $75,000 of income or more. Minnesota has the highest income tax burdens in the nation for 6 of the 13 senior filer examples included in the report. Conversely, Minnesota's income tax burden ranks in the bottom ten nationally for 5 filer types -- all between $10,000 and $35,000 of income. A Minnesota married couple with $35,000 of income has the lowest income tax burden in the nation. When looking at total income taxes paid -- federal, state, and local -- Minnesota's rank increases or remains unchanged for 37 of the 38 households examined. For example, Minnesota ranks 7th nationally in total income tax burden for the $150,000 head of household filer compared to 10th when looking at state and local income taxes only. For a married-joint filer with $150,000 of income, Minnesota's rank increases from 15th to 10th when combining federal, state and local income taxes.